This is your chance to make a big difference! Our first EP is in the pipeline … Get involved and become part of this exciting project! Wow! 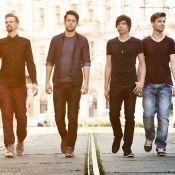 Diese Band ist einfach Wahnsinn! Freu mich schon so auf die Konzerte! Ich wünsch euch viel Erfolg und freue mich darauf, euch wieder zu hören. Geile Lieder habt ihr da gemacht! Freu mich schon auf mehr! :) Alles Gute für euer EP Projekt! Das sind wunderschöne Nummern. Ich freue mich schon sehr auf die EP und ebenso auf ein Konzert! This project ended successfully on 9/10/2015 19:00! You receive as a thank you an exclusive selfie of the band! We will send you, direct to your home, our brand new EP. We will send direct to your home an autographed copy of our new EP accompanied by our new flyer with personal greeting. A signed EP will be hand delivered to you by a band member of your choice (only available within Vienna or by arrangement). You receive the mega fan package with an EP, a signed flyer, a unique video greeting and the handwritten lyrics of the song in our video. As a thank you we would like to give you a ticket to our single release party in addition to a copy of our new EP. This reward can also make a great present. !!NEW!! You will receive the mega fan package, but instead of a video message you have the opportunity to get to know us personally in a skype session with the band. !!NEW!! Fancy a good breakfast? Then let our singer Michael serve you breakfast at the Hotel Ambassador in Vienna. Along with your coffee he’ll also bring you our new CD. The breakfast is on us! !!NEW!! Is it time for your guitar to have a service check? Andy will do this personally for you at the music shop 3Klang in Vienna. !!NEW!! You have a once in a lifetime opportunity to have a 90-minute training session at the Fitness-Studio Injoy with your very own personal trainer Michael. You will receive a 90-minute online guitar lesson from Andy! It is also possible to give the lesson as a gift, e.g. as a Christmas present, as the date is fully up to you. You will receive a 90-minute online bass guitar lesson from Rich! It is also possible to give the lesson as a gift, e.g. as a Christmas present, as the date is fully up to you. You will receive a 90-minute online drum lesson from Mathias! It is also possible to give the lesson as a gift, e.g. as a Christmas present, as the date is fully up to you. You will receive a 90-minute online singing lesson from Michael! It is also possible to give the lesson as a gift, e.g. as a Christmas present, as the date is fully up to you. !!NEW!! Up for grabs are two tickets for the single release party along with the chance to join the band for an aperitif before the show. You and a friend are on the guest list for the EP preview event and of course there will also be a buffet! !!NEW!! Exclusive rehearsal room concert for two people! You’re our special guests in our studio and we’ll play a 30-minute set especially for you! We will cover your favourite song and send it to you as an mp3 file. We are forever grateful for your support and your name will appear in our booklet as a sponsor. You will also receive a signed copy of our EP! Jeder Song erzählt eine Geschichte. «nature» ist feinster englisch-sprachiger Pop/Rock mit gefühlvollen Stimmen ohne viele Schnörksel drumherum. Da darf stilistisch ein großer Bogen gespannt werden. Es sind Songs, die einen sofort mitreißen und die Gedanken mit auf eine Reise nehmen.